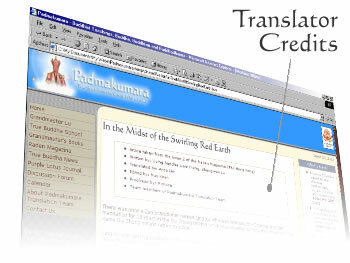 The Padmakumara Translation Site has been established by a team of self-volunteered disciples of the Illustrious Buddhist Grand Master, Living Buddha Sheng-yen Lu. As Grand Master Sheng-yen Lu teaches predominantly in Chinese, we are actively striving to provide high quality English translations of His Dharma teachings including His talks, books and articles. Honor the Guru - one must have utmost respect for one's teacher in order for any training to be successful as it is by the teaching of one's Master that one is able to progress at all. However, if you have no knowledge of your Master's personality, of his interests and temperament, you will certainly find it difficult to generate a heart of loving reverence towards your Masters teachings, and will struggle to honor the Guru. 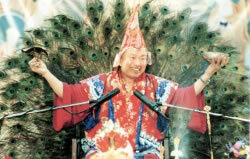 We hope that by acting as translator to His Holiness, Grand Master Sheng-yen Lu we can help bring you a little closer to Him and offer you a tantalising glimpse of His unique persona. Treasure the Dharma - the teachings of True Buddha School include a wealth of practices from all the major wisdom traditions including the highest level Tao, Tzogchen, Mahamudra and Zen. These practices can help a person to transform all the major areas of their life including their health, their relationships and their wealth. Moreover, they also teach us to find our inner nature and realise our true and fullest potential as human beings, transcending both life and death and achieving Perfect Enlightenment. We learn to become more compassionate, patient and wise. 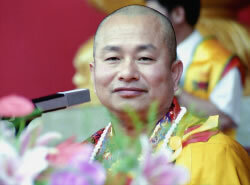 These teachings are open for all to read and learn from. By reading from the wide range of teachings given to us by Grand Master Lu, we hope to convey to you a Dharma that is truly a treasure to behold and learn. Practice Diligently - by constant and diligent practice, one can train your mind, body and spirit to reach higher levels. With practices, tips and guidance from Grand Master Lu's own experience, together with the companionship and support of like-minded individuals and a full calendar of events, we hope that you will find all you need to create zeal and joy in realising your own potential. We operate as a voluntary team, working together to produce this site. You'll be able to meet most of the team in the Discussion Forum. We are always happy to find others who share a similar path. In particular, if you can help to translate Buddhist teachings from Chinese into English we would be especially glad to hear from you. Whilst we cannot pay anyone for their time, we will acknowledge all work you do with a credit note and you'll also be in the privileged position to receive teachings from Grand Master Lu from a wide range of sources, including Grand Master Lu's books, tapes and magazines. We are extremely lucky to have the widespread support of the True Buddha School Sangha community as is evidenced through our exclusive content of new releases, previously undisclosed Dharmas and unique photography. We'd love to share this unique opportunity with you. If you feel that you would be able to spare some time to assist others by helping in the most meritorious way, please do send us an email.